Please note: This is a standalone short story of 17,000 words. Mila Brooks is your seemingly average 16-year-old aside from the fact that she doesn’t have any friends. Her father’s position as chief technology manager at the biggest tech firm in the world, Mahone Inc., has alienated her from her peers. As a beta tester for the latest implant, a computer chip that connects you to The Internet of Things, Mila is sure everyone hates her because of her upgrade. When Mila hears Parker’s voice in her head, everything changes. 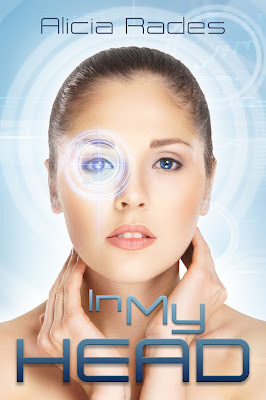 IN MY HEAD IS FREE ON AMAZON! I regain consciousness just in time to panic. I can’t see anything, and suddenly every nerve in my body goes into overdrive. My body shakes as I reach out for my father. “Dad!” I cry. I know he’s there somewhere. My arms flail as I try to find something to ground me to reality. A moment later, I feel hands clamp around my wrists. “It’s okay,” I hear my father’s voice say. “Dad!” I say breathlessly. I blink a few times until the room comes back into focus. The glowing computers outline my father’s silhouette. He’s right. I should be fine. This is the twelfth upgrade I’ve had in the past ten years. Never before had I woken with such an odd sensation. What if this time is different? 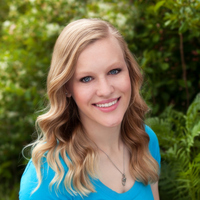 By day, Alicia Rades is a freelance writer, blogger, and editor. When inspiration strikes, she is also an author. Alicia has been captivated by the YA paranormal and supernatural genre since reading The Seer series by Linda Joy Singleton when she was 12 years old, and most of her stories are born out of the love for the genre. In college, Alicia majored in professional writing. Alicia lives in Wisconsin with her husband and too many fish to count. A sinopse pareceu-me interessante. Acho que vou fazer o download da Amazon.